I met Charles when we were in college. We were both dating different people back then and he was good friends with the guy I was dating. I remember the night I met him, I was incredibly nervous because I was meeting several new friends at once. And I couldn't help but think that I was outta my league. Thankfully, Charles is the kind of guy that looks past all that silliness. He made me feel like I fit in, and even after we started dating other people he made sure to check in every once in a while. He's a friend for life in my book! So when I heard he got engaged, I was floored with excitement! They are both teachers living in North Carolina now. (boo! so far away!) And you know when you meet a couple and it just makes sense? Yah, that's Charles and Margarete. We met on an real early morning at Green Lake. Both dressed to the nines, they told me about how they met and how they wanted to play tribute to their story. You're seeing that right... 90s themed "love & basketball" style! C + M met on the basketball courts at Green Lake a few years back. A go to place for Charles. His game was just wrapping up, when all of a sudden he saw a gal that caught his eye in the distance. But he could tell she was out of breath and probably didn't need some guy approaching her. Luckily for Margarete, an older gentleman decided it was his duty to come to her rescue. She had just run 9 miles in the heat and was just trying to cool down. But this old guy thought she needed her "reflexes checked". Charles watched from a distance as Margarete sat down and watched the guy's fingers go back and forth. Finally, the old man threw a basketball at her to see if she could catch it. She missed and the ball smacked her in the face. That's when Charles knew he should intervene. And the rest is history! 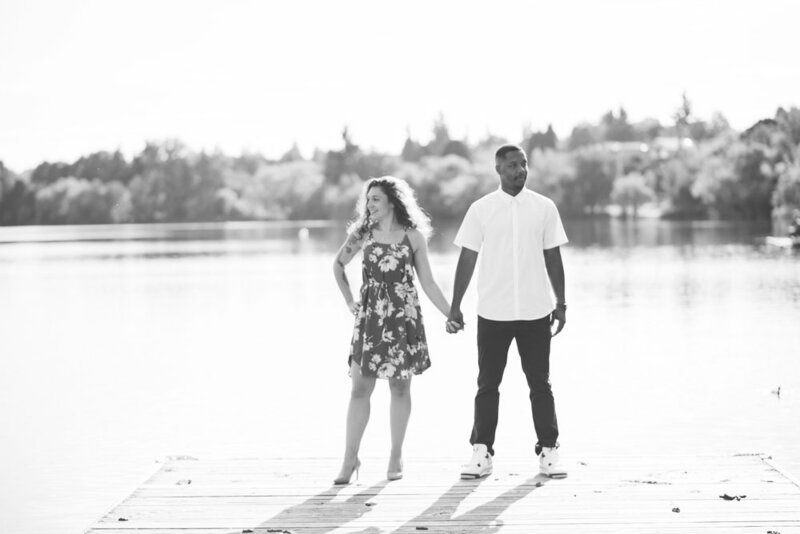 Check out the rest of C + M's romantic and awesome morning around the lake! I had so much fun with these two and am encouraged to know they are fighting the good fight. These two are a testament to the fact you are most beautiful when you are yourself, 100%. If you're thinking about getting pictures with your boo, I encourage you to think about what makes you two ... YOU TWO. Think about what makes you laugh or the things you cherish most, and have your photographer capture that. I promise you won't regret it.